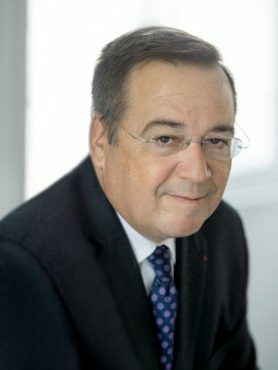 Jean-Frédéric de Leusse began his career in the Conseil d’Etat (French Supreme Administrative Court), followed by three years with Crédit Mutuel, before going on to hold a number of senior management positions within France’s Ministry for Business and Economic Development and the Ministry for Economy and Finance. Following this, he was appointed CEO of Sofipost and member of the Executive Committee of La Poste and then spent 10 years with Crédit Agricole, firstly as CEO of the Fédération Nationale du Crédit Agricole and subsequently as deputy CEO of Credit Agricole S.A.. In 2011, he became a Partner at Banque Arjil, part of the Altium group. On 1 March 2012, Jean-Frédéric de Leusse joined the UBS Group as Chief Executive Officer of UBS (France) S.A. and Country Head of UBS France & Monaco. In June that year, he also took on the additional responsibilities of Chairman and Managing Director of UBS Holding (France) SA and of UBS Securities. Jean-Frédéric de Leusse is also President of the Fondation ARSEP, which helps to fund research into multiple sclerosis.